Clint Kemp from Black Fly Lodge in Abaco and the Bahamas Fly Fishing Lodge Association spoke about the regulations battle today. He didn’t have any updates or news to share, but he did have some perspective to share and I think it is worth listening to. So… here’s Clint. There is sometimes some confusion about what fishing regulations are like in the States. Pretty much, in the US, you can fish where you want to fish. If the season is open and you can get on the water, you can fish it. You don’t need a guide to fish in Florida, not even for Tarpon at the height of the migration. You don’t need a guide to fish for redfish in Louisiana or Texas. You don’t need a guide to fish for trout in Yellowstone. You don’t need a guide to fish the Big Horn or the Big Hole in Montana. You don’t need a guide to float the Green River in Utah. You don’t need a guide to fish the Deschutes for steelhead in Oregon. You don’t need a guide to fish for cutties in the Snake in Idaho. You don’t need a guide to fish for salmon or trout in Alaska. You don’t need a guide to fish for bonefish in Hawaii or Puero Rico. You don’t need a guide to fish for rainbow trout in California. You don’t need a guide to fish for stripers in Montauk. There are a few places that have special regulations, usually to relieve fishing pressure or to address boat traffic issues. There are some places you are not allowed to guide, like in some Parks. In all of these places there are large and thriving numbers of guides. I’d be shocked if Florida doesn’t have more guides than the Bahamas. Most guides don’t go through special training, although many are required to get a guide’s license, which has more to do with liability insurance than skill. To my knowledge these guide licenses are (mostly) purely administrative. They don’t asses if you know how to fish or if you know which end of the rod to use. You fill out the form and pay your money and you are a guide. Many guides are booked a year in advance by the same clients, year after year. People use guides in all those places. They use guides even when they can fish on their own without guides. Anglers, in the US, use guides for many, many reasons. Maybe they don’t know the water well, or they are new to fishing. Maybe they are expert fisherman and just want to benefit from the guide’s deep knowledge of “place.” Maybe they just enjoy the experience of fishing with someone who knows the names of the birds and the trees and the flowers. Maybe they only have a few days to fish a year and want to maximize their time on the water. Bahamian guides are no different. People choose to fish with Bahamian guides for many of the same reasons. 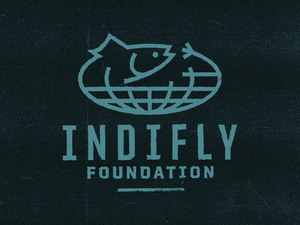 You can let people choose how they want to fish and so long as people aren’t hurting the fish or the flats, many, many, many will chose to fish with a guide (and anglers are not harming the flats, by and large, as DIY anglers can only access a tiny fraction of the flats a guide with a skiff can access). I love fishing with a good Bahamian guide in their home water where they know the tides like the backs of their hands and can find fish even when the wind is howling and the lights are off. That’s worth a lot, and American anglers know that, and will pay for it, if that’s the kind of angler they are. You want to regulate your own industry. Great. However, you also need to understand your consumer, the buyer of your product. No company can just ignore their consumer and then demand that they continue to buy their products. If you alienate your buyers, your buyers will go other places and become someone else’s buyer. That’s not a threat, that’s just how markets work. In your particular case, the buyers of your products really don’t like being dictated to because they are rarely dictated to when pursuing their hobby in their own country. If you roll out dictates to them in your country they may not react well. I’m not talking about buying a license here, I’m talking about DIY. Almost all anglers have to buy a license in the US, but this is a fast and straightforward process, often done on-line or over the phone or through a business which is open on the weekends and holidays. We make it easy. It isn’t a barrier. There are also some places that don’t require a license, like Hawaii. Bookings last year were up in Belize, from what I understand. Were your bookings up? I’m not talking about what someone told you about their bookings… I mean your actual days on the water. Did you do more than you did last year? If your days were down last year, I’d bet the businesses who rely on the DIY anglers were hit even harder. The guest houses and the car rentals and the restaurants and shops. You start aiming at your anglers and it isn’t just the guides who suffer, it is all the other folks too, your neighbors. It is true that Eastern Canada has some very restrictive rules on guides. They are the outliers, not the norm. Regulate your industry, but know your decisions and how your decisions are communicated impact the willingness of your consumers to consume your products. So… this came from Minister Wells (minagriculturemarine@bahamas.gov.bs) and it appears to contradict the Prime Minister, insisting the regulations ARE still in place and NOT suspended. Additionally, the press release was either crafted with a great deal of care to say something pretty important, or it was crafted with absolutely no care and makes a huge implication without understanding what it had done. The statement says “…visiting anglers engaged in fly-fishing activities be required to use the services of a licensed guide.” That doesn’t call out the 2:1 angler:guide ratio for boats, but just says if you are fly fishing in the Bahamas you are going to need a guide. That’s DIY folks. That’s been what these guys have been after the whole time. So… was that just super careless or was that the first big announcement of DIY as a fight out in the open? Truth be told… I have no idea. These guys were supposed to be the good guys, but they don’t seem to be all on the same page. This is a page straight out of the BFFIA playbook and a massive step backward for the industry and all those who care about the Bahamas. And so it continues. The PM on one side, the Minister for Fisheries on the other. Here’s the latest article from the Tribune. These folks claiming the sky would fall if the regulations are revoked… I mean… that would just revert to the situation the flats have been in since, I don’t know, Bahamian Independence. Over-harvest of conch and lobster. Poaching from foreign vessels (like from the DR). Increased demand for unsustainable catches by countries who are buying into the Bahamas in a big way, like, oh, let’s say China. Development that destroys nursery habitat or impacts spawning aggregation sites. 754. Impact of catch and release bonefishing. But, yeah, by all means, let’s put in place some ill-thought-out regulations to regulate issues that don’t exist and let’s throw in some xenophobia, some protectionist propaganda, some fear mongering and let’s also ignore all those concerns voiced by the people who actually contribute financially to the industry. Also… let’s make it hard to get a license (like not making it possible to get one on a weekend or holiday). Way to go guys. Bang up job. Cindy and the Abaco guide’s association must be tired of constantly having to issue rebuttals to this sort of idiocy. I don’t envy them. Here is to hoping the PM wins on this one. Also, let’s hope Fisheries loses this bit from their portfolio and it heads over to the cooler heads at Tourism. Bahamas Regulations – No one knows what is going on, basically. Remember last week when things seemed to be kind of settled? Well… hold on a sec. Turns out the Minister for Fisheries is not on the same page as the PM, according to this story from the Tribune. The problem here is Minister Renward Wells. He’s the one overseeing fisheries and he’s from Andros. Being from Andros he’s influenced by the very strong pro-BFFIA sentiment there and appears to be buying into some of their utter nonsense. Minister Wells seems to be insisting that provisions like the “2 anglers, one guide” rule for boat is in-line with regulations in Colorado and Montana, which is, of course, a complete and total fabrication. You want to put three friends in a boat and have them row down a river in Colorado (or Montana or California or Wyoming or Idaho) without a guide you can certainly do that, as many, many, many (that’s THREE manys) anglers do. Of course, I doubt Minister Wells looked into such matters himself, just taking BFFIA talking points as truth. To take a position like that, that such a provision is similar to other places, you have to just not look into it at all. It would take about 2 minutes on Google to figure out that is total nonsense. You can also fish for reds in Louisiana without a guide. 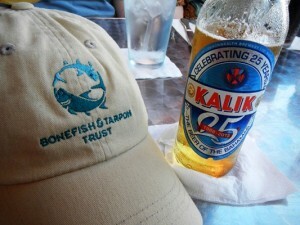 You can also fish for tarpon in Florida without a guide. There is no State in the US where you are required to use a guide or to have a 2:1 ratio. It isn’t a thing, no matter what the BFFIA says. Now, I thought once the PLP was out we’d be past this type of utter and complete shite, but… but… Andros vs. Abaco/the rest of the Bahamas is kind of like the Urban vs. Rural divide that used to be a driving force in American politics. The position of the PM seems pretty clear. The corrosive effect of the BFFIA seems to be lingering, doing nothing positive and sewing discord, kind of like what Taco Bell does to my digestive tract with similar end results. I’ve been traveling, so haven’t posted more about this, but I’m sneaking a few minutes here at work to get some more news out. The Bahamas regs put into place earlier in the year are still on the books, but won’t be enforced until a thorough review can take place. I’ve seen this from two sources and am trying to get an official confirmation. So, you can go to the Bahamas and fish however you are used to fishing. For the short/intermediate term, things revert to how they’ve always been. This makes me want to put the Bahamas back on my travel list for 2018. The uncertainty caused by the regulations have hit the Bahamas hard. Business is down, for most lodges, between 25-50%. That’s a big hit for some places that eek by to begin with. What the govt. 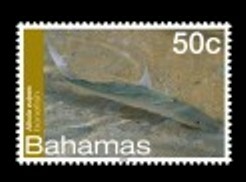 of the Bahamas wants to do now is encourage their anglers to come back. So… consider it. I know for me a cold Kalik would go down pretty well. Here is Beau Beasly’s recent article from MidCurrent. It is almost certain a license will remain part of what happens down the road, but not until you can get that license on-line, easily, and without having to go to a govt. office that isn’t even open on weekends. I think most everything else is up for review and I hope it is a thoughtful, inclusive process and produces an end product that puts the Bahamas at the top of resource management. One can hope. This stuff just doesn’t die, does it? All is well… not to worry. There is a new draft of Bahamian regulations making the rounds. I’ve read it, thought about it and asked around about it a bit. Here’s my take. It doesn’t look to bad to me. I think there is a little clarification around boats, guides and exactly when you need one, but for the most part, it looks pretty good. There is no DIY ban. You’ll need a license, but that’s not going to be an issue. No bans on foreign lodges (that was a dumb idea to begin with as other legislation covers foreign investment). Guides will need to be certified, but that is probably also a good thing. WHY this all looks good is based on who is in control of all the misc. parts. The Ministry of Tourism is put in the driver’s seat. That’s good. The Ministry of Tourism cares about the whole tourism sector, not just one tiny segment of it. They have the wider perspective needed. They are pro-angler and pro-restaurant owner and pro-grocery store owner and pro-Bahamian. Of course, the “anti” crew isn’t happy about the new draft, which should pretty much tell you this is headed in the right direction. If I were a betting man, I’d put good money on this whole thing either not happening at all, or very much breaking our way. Well, look who I saw at the Pleasanton Fly Fishing Show. That is Cheryl Bastian from Swain’s Cay Lodge and Benjamin Pratt from the Ministry of Tourism. 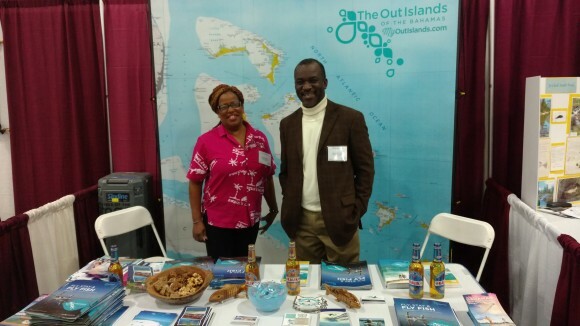 They were there from the Bahamas Outislands Promotion Board, doing their part to help convince people that the Bahamas is still the place to be, mon. I had a good conversation about all that has gone on and I feel positive about the direction things are headed. There is a new draft of the legislation somewhere and it is foolishness-free. All the good stuff is in, all the bad stuff is out and I feel like this could turn into a real positive. There is going to be a training program (there actually already is, but it is going to get better), certification of guides and a daily license fee in-line with Florida prices. And, key point, none of this will be controlled by He-Who-Must-Not-Be-Named. 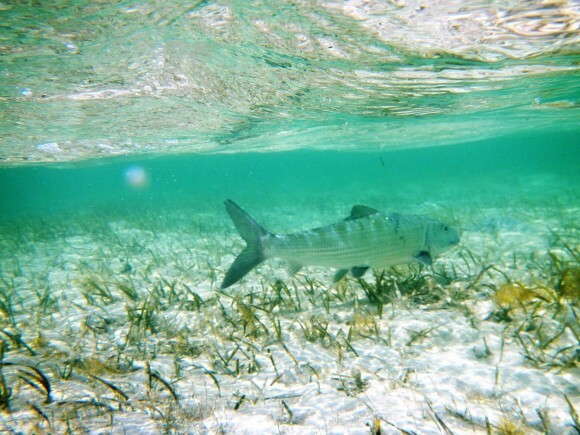 On my recent Abaco trip we had no fewer than six people tell us they could guide us for bonefish. Each of those people knew something about bonefish, but not enough to take money for a day on the water. None of those people was “professional guide level.” None of those people had apprenticed under any bonefishing guide. If we had been going after snapper or grouper, they would have been great, but for bonefish… not so much. Training and certification is needed. I’ve known all along that there were good people out there who are in our corner, fighting the good fight and it was good to meet a couple of them face-to-face and to shake their hands and offer my support as well. I feel more confident than ever that none of the destructive aspects of the first proposed legislation are going to see the light of day. Get ye to the Bahamas. What is going to happen in the Bahamas in 2016? 2015 saw some pretty acrimonious discord for the Bahamas. Efforts to shut down the DIY fishery in spirit, if not in fact, were brought out and paraded around and the ensuing arguments left no one happy. The AG’s office is waiting for US anglers to be distracted by something shinny before breaking out something really controversial. The AG’s office is waiting until they deal with more pressing issues, like hurricane relief, before picking something like this up. The powers that be are just letting it die a quiet death, knowing there is no interest in estranging Yank and European anglers who come to the Bahamas and drop some serious coin, year after year, especially with Cuba coming on-line and other destinations like Belize and Mexico still being pretty competitive. All of that is just total speculation and speculation is all I can really conjure up because the news out of the Bahamas is just the sound of the wind through the mangroves. As I write this, here on January 1, it seems very likely nothing much will change in the Bahamas in 2016. So, plan your trip. If anything does happen, it won’t be over-night and you’ll have plenty of time to alter if things go badly, but I think the odds of the most odorous of the proposals coming to pass is fading away like that school of bones moving off the flat into deeper water. Here’s a recent press release out of the Bahamas. Basically, they want to remind you that nothing has changed and that the Bahamas is still a fantastic place to visit, even after Hurricane Joaquin screwed a few of the islands up. Hard to argue with any of these points. This press release should not be taken as a defeat by the BFFIA (Bahamian F-ed-up Fiduciary Insanity Association). This points in that general direction and may be a sign some of the people in positions of power realize the LAST thing needed at this point is a confusing and xenophobic message telling some tourists they are not wanted. The Cliff Note version of my take on things is this… You want to go to the Bahamas, go ahead. You’ll be able to fish, DIY, semi-DIY, fully-guided, partially-guided, at least for now, and that won’t change abruptly or in the really short-term. Of course, I’d urge you to support those who have supported us, the anglers. And… you may also want to chip in to help those who got leveled by Joaquin to get back on their feet, which you can do here. BAHAMAS, October 8, 2015 — The Bahamas Ministry of Tourism (BMOT) wishes to advise that all categories of anglers are welcome to fish The Islands Of The Bahamas this 2015-2016 season and that the vast majority of the islands are ready and open for business as usual after Hurricane Joaquin. Anglers are further advised that no restriction on fishing, no new taxes, no across the board increase in prices or licensing fees have been introduced. In the event there are any changes, be assured that Ministry officials will notify the global fishing community well in advance. Throughout The Islands Of The Bahamas you will find a mix of international and locally owned upscale, mid-priced and economy lodges with a range of affordable packages and options. Each bonefish lodge has its own charm and certified guides. Local guides have been trained to provide a safe and customer friendly angling experience based on globally accepted sustainable principles. The practice of “Catch & Release” fishing is strictly observed. The Bahamas continues to be the ideal flat fishing destination for avid fishermen with 100,000 square miles of the most renowned fishing flats in the world, and an abundance of fish species including bonefish, permit, tarpon and other tropical sports fishing species. The Out Islands of Abacos, Andros, Bimini, Cat Island, Eleuthera, and The Exumas are premiere flats fishing locales. With close proximity to the Continental United States, just 50 miles from Florida and a 30minute flight via commercial airlines, and average winter temperatures ranging from 21°C to 27°C (or 70°F to 80°F), anglers can still make it for the perfect fall flats fishing experience. Visit http://www.bahamas.com/fishing for more details and to book your fishing trip to The Bahamas today. About The Islands Of The BahamasThe Islands Of The Bahamas have a place in the sun for everyone from Nassau and Paradise Island to Grand Bahama to The Abaco Islands, The Exuma Islands, Harbour Island, Long Island and others. Each island has its own personality and attractions for a variety of vacation styles withsome of the world’s best golf, scuba diving, fishing, sailing, boating, as well as, shopping and dining. The destination offers an easily accessible tropical getaway and provides convenience for travelers with pre-clearance through U.S. customs and immigration, and the Bahamian dollar is on par with the U.S. dollar. Do everything or do nothing, just remember It’s Better in The Bahamas. For more information on travel packages, activities and accommodations, call 1-800-Bahamas or visit www.Bahamas.com.